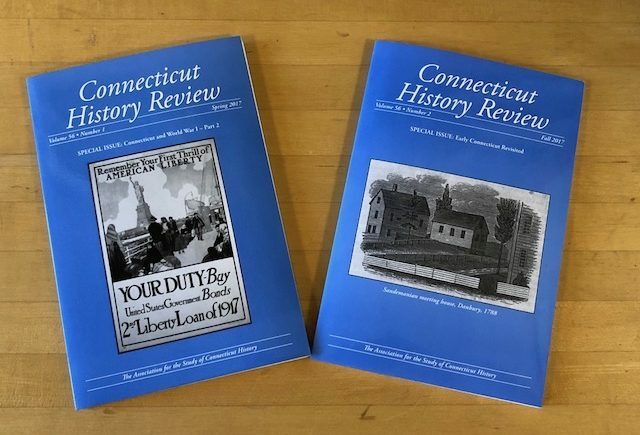 Connecticut History Review is the only academic, peer-reviewed, journal devoted to the history of the state and is a publication of the Association for the Study of Connecticut History (ASCH). Beginning in 1974, it was originally published as Connecticut History, with a title change in 2014 to Connecticut History Review. The journal publishes twice yearly, in spring and fall, and it aspires to serve many different constituencies—museums and historical society professionals, academic scholars, graduate students, educators, and history buffs. Each issue contains original articles, research notes, and book reviews on the history and culture of Connecticut; all are peer-reviewed. The journal seeks original research articles on a wide variety of topics, spanning all aspects of Connecticut’s history. It also seeks essays on special programs or holdings of historical societies and museums, as well as articles on history pedagogy and educational programs at both the college and secondary levels. The journal also solicits authors and publishers who would like to have their books reviewed. The journal contents are indexed in Academic Search Alumni Edition; Academic Search Complete; Academic Search Premier; Academic Search Ultimate; America: History and Life; Current Abstracts; MainFile; MasterFILE Complete; MasterFILE Elite; MasterFILE Premier; TOC Premier. Full-text back content is available to subscribers for free and to others for a fee at JSTOR. Connecticut History Review is published by the University of Illinois Press, which handles subscriptions and membership for ASCH.